My love affair with America’s Test Kitchen only grows stronger and stronger… I’ve been making a lot of their recipes without a single disappointment (insert discreet knock on wood). Pork stir-fry can be pretty tricky to prepare. More often than not the meat either turns out too dry or too greasy, and the flavors fail to mingle well. Cook’s Illustrated to the rescue. They tackle the many issues with this preparation by using boneless country-style pork ribs, and soaking the pieces of meat in a solution of baking soda. Baking soda acts by raising the pH (decreasing acidity), therefore affecting the charges present in protein molecules, which in turn changes the way the molecules interact with each other. With a raise in pH, the protein strands unfold and relax, in other words, the meat becomes considerably more tender. If you take the process too far, either by using a huge amount of baking soda or by allowing the meat to sit for too long in its presence, you’ll end up with mushy meat. But when performed correctly it results in meat with fantastic texture. 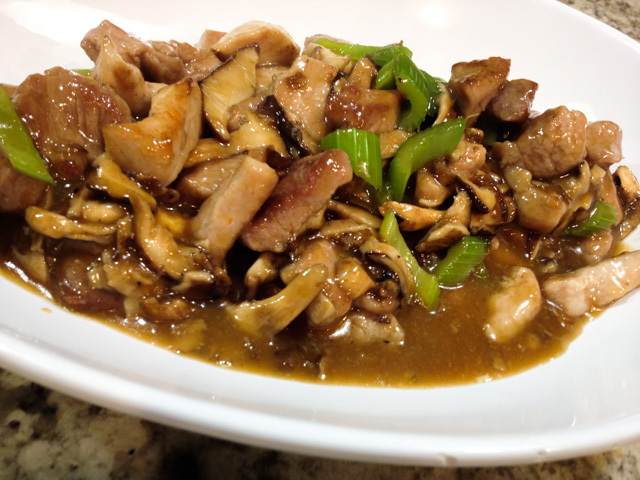 ATK also incorporated a coating with cornstarch before stir-frying, which helps retain moisture as the meat cooks. Genius, right? As to the sauce that finalizes the dish, they use ketchup and fish sauce to up the level of glutamates, giving it a boost in flavor. Seems simple and straightforward enough. In fact, the dish comes together quite quickly once you do the initial prep of the meat, so have all your ingredients ready, and get busy… Dinner will be served in no time! For the sauce: Whisk all ingredients together in bowl; set aside. For the pork: Cut pork into 2-inch lengths, then cut each length into 1/4-inch match sticks. Combine pork with baking soda and water in bowl. Let sit at room temperature for 15 minutes. Rinse pork in cold water. Drain well and pat dry with paper towels. Whisk rice wine and cornstarch in bowl. Add pork and toss to coat. For the stir-fry: combine garlic, scallion whites, and chili paste in bowl. Heat 1 tablespoon oil in 12-inch nonstick skillet over high heat until just smoking. Add mushrooms and cook, stirring frequently, until tender, 2 to 4 minutes. Add celery and continue to cook until celery is crisp-tender, 2 to 4 minutes. Transfer vegetables to separate bowl. Add remaining 3 tablespoons oil to now-empty skillet and place over medium-low heat. Add garlic-scallion mixture and cook, stirring frequently, until fragrant, about 30 seconds. Transfer 1 tablespoon garlic-scallion oil to small bowl and set aside. Add pork to skillet and cook, stirring frequently, until no longer pink, 3 to 5 minutes. Whisk sauce mixture to recombine and add to skillet. Increase heat to high and cook, stirring constantly, until sauce is thickened and pork is cooked through, 1 to 2 minutes. Return vegetables to skillet and toss to combine. Transfer to serving platter, sprinkle with scallion greens and reserved garlic-scallion oil, and serve. Comments: In the past, I’ve attempted a few recipes using boneless country-style pork ribs and was quite disappointed by how they turned out, particularly in texture. I had pretty much given up on them. When I noticed they used this cut for the stir-fry, I was intrigued. Could they possibly make it work? Never doubt ATK, my friends. They do their home work, or… should I say their kitchen work, testing every variable imaginable. When Phil and I sat down to enjoy this stir-fry, we both had the same thought: this feels like a meal served at an upscale Chinese restaurant. Let’s be frank, Chinese restaurants can be a gastronomic disaster, every dish presented with the exact same gloppy, overly sweet soy-based sauce. But when you find a place that offers truly authentic recipes, it’s an amazing experience! I had fantastic Chinese meals in São Paulo’s huge Chinatown during my college years. I can picture this recipe served in such a setting, or better yet, in the comfort of our bewitching kitchen. Sounds great, Sally. How’d you get permission to reprint the recipe? It was a very convoluted process… I ended up getting help from a fellow blogger who a few months ago joined ATK. Through him I managed to reach the right person at the organization and get the official ok dokie. I could hardly believe it when I got her email…. a happy dance followed. I figured that it was easier said than done. I salute and appreciate your effort! I am sure this will be a hit with your family! Miss A included! Perhaps that post is what I remembered … re: policy. I have mirin, sake and a Korean rice wine. Just no Chinese. 🙂 The only sherry I have is a sweet Marsala that I use in my cannoli dough. Oh that looks so good. I made a beef stir fry last night and I can’t wait for leftover time. 🙂 I’m making this next! I luv America’s Test Kitchen too, so many solid recipes. 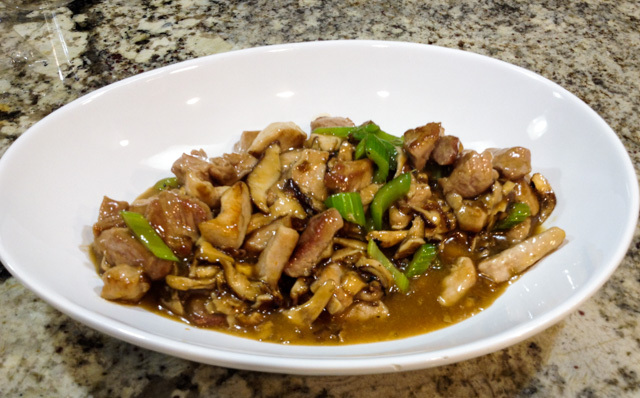 This Sichuan Pork Stir-Fry looks perfect Sally, an awesome flavor combo! Gloppy is right, which is why I haven’t been to a Chinese restaurant since we were in San Francisco! Terrible stuff. But your stir fry looks fabulous. I didn’t know fish sauce was a Chinese ingredient. Isn’t that the best stuff?!! Yummy!! This looks so good. Especially, the garlic sauce 🙂 Now I know what to make for dinner.